Jailhouse, formally known as the Muknal's Remote Siphon on the QRSS maps, is reached through the same exit from the highway as Mayan Blue. The key must be obtained in Tulum at the house just past the Ejido Tulum home. Entry is currently 150 pesos per person. Going up the Mayan Blue road past the Mayan Blue parking lot, you will pass a brand new road to the right. The next Y is at a house, and you go right. Be careful of the tethered bull! There is ample parking and a number of tables at the dive site. A caretaker will come and ask to see your key. Entry is via a set of easy stone steps to the edge of the pond. There is about a 2' dropoff from the stone at the edge to the silty bottom. It's best to stay very close to the entry edge while gearing up and doing checks, to preserve the visibility along the mainline. The line is tied off to a branch in open water, just below the polypro rope. It descends through a duck-under, and then is tied off on about a 2 foot slab of rock, and makes a 90 degree turn. The bottom is mung, but if you keep your fins in the ceiling, you can get through the entry without damaging the viz for those behind you. The cave really has two parts -- one section is fresh water, and very, very dark. The other portion is below the halocline, and very white and cobalt blue. Salt water passage exists on both sides of the T, but the biggest passage is to the downstream side. Mosquitoes and other bugs are a menace here! Archaeologists working at a site in Tarragona, in Cataluña, have made a find which they describe as ‘of great importance’ in the world of palaeontology: the remains of a mammoth which they believe could be more than one million years old. 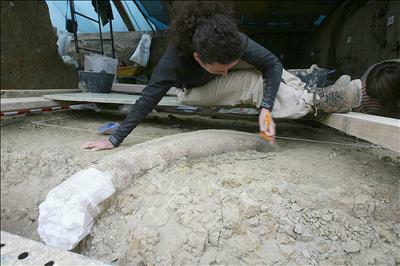 They found a tusk from ‘Mammuthus meridionalis,’ and two teeth, which could be from the same animal. Flint tools were unearthed at a higher level which could provide evidence of human habitation in the area more than half a million years ago. Roman ceramics were also discovered. The find was made on the finca La Boella, between La Canonja and Tarragona. The head of the excavation, Josep Vallverdú, described the discovery as very important in providing more knowledge about the first human migrations from Africa to Europe over one million years ago.